Oh look! Another recipe where I realised half way through that I didn’t have enough of some ingredients. Predictable? Moi? Shh. This is a quick post for a very quick bake. 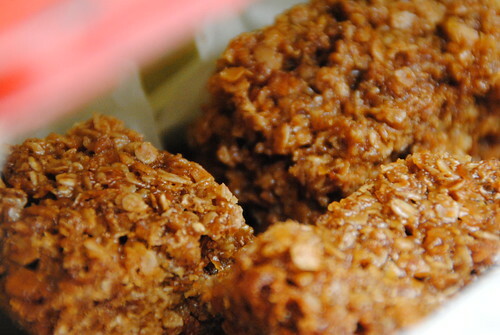 It’s an “adaptation” of my sister’s/mum’s unbeatable flapjack recipe . I’m not certain whose it is, but they both have their fair share of unbeatable recipes and are much better bakers than me, it’s just that I’m geeky enough to blog it. You can find the unadulterated version here. Put butter, sugar, syrup and coconut in a large saucepan, heat until sugar and butter are melted. Shreddies, huh! 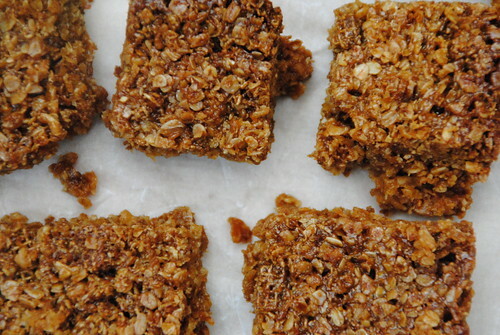 I do love homeamde flapjacks. I sometimes add coconut to them too. I kinda like the malty chewyness. I don’t think you could go much higher in the shreddie to oat ratio though. How funny Gill, shame you didn’t have any muesli in the house but who know your new version might catch on! I know and it is VERY unlike me not to have any muesli the house. We are trying to cut down on the amount of times we go to the supermarket and just do one big shop a week. It’s good but I keep forgetting things. We now have a spreadsheet. Geek alert!